The photoelectrochemical properties of semiconducting metal oxides such as titanium oxide (TiO2), and tungsten oxide (WO3), have been well studied. While they are normally used as electrodes, research has shown that photooxidative chemistry can be performed by irradiating suspended metal oxide powders in the presence of the reagent of interest. These photoactive powders are known as photocatalytsts because they are able to initiate photochemical reactions that would not normally occur in the irradiated system without the powders. Initially, inorganic species were investigated, and now organic compounds have been studied as well. The nonspecificity of the photocatalytic oxidation mechanism on organic substrates has led researchers to consider biological species as possible targets. The application of wastewater detoxification is now one of the major applications of the photocatalytic process. The generalized mechanism of photocatalytic oxidation in aqueous systems is as follows. In the first step, a molecule of water is adsorbed onto the semi-conductor particle surface. Irradiation of the oxide generates electron-hole pairs. As the hole migrates to the particle surface, it interacts with the water molecule, producing a hydroxyl radical, HO·, and a hydrogen ion, H+. The free electron, e-, reacts with dissolved O2, ultimately making water. However, the adsorbed hydroxyl radical enters the solution and attacks any biological substrate in the vicinity. The oxidizing power of hydroxyl radicals toward organic substances is well known since it is recognized as the reactive intermediate encountered during oxidation via hydrogen peroxide. The lifetime of the radical in pure water is normally quite lengthy, but in an outdoor situation it is rapidly quenched by interaction with dissolved organic or inorganic substances. FSEC's initial research objective was to investigate the application of a metal oxide photocatalyst to a surface vulnerable to biofouling and determine if the photocatlyst offered a means of protection. The work selected fresh water algae species as the initial target since they could be easily maintained and tested in the laboratory environment. There are many species of algae that are affixed to a surface for most of their life cycle, propagating themselves by a number of methods such as scission of plant segments, rhizoidal outgrowths, or production and release of zoospores. Oedogonium is a genus of common fresh water, filamentous algae found in lakes, ponds, and aquariums. These are algae that prefer to live in an immobilized state, but are able to propagate and spread through the release of zoospores into the open water. These zoospores are able to attach and adhere to a suitable surface and grow into hair-like filaments that can be many centimeters long. The algae inhibition experiments were performed by coating 5 x 5-cm white Portland cement substrates with a photocatalyst formulation consisting of the inorganic photocatalyst powder suspended in a dichloroethane solution of poly(methyl methacrylate). The substrates were mounted vertically on a plastic rack leaning against the back face of a 40 liter, rectangular glass tank. Samples were irradiated through the front face with a 4-element light bank consisting of two black light lamps and two conventional fluorescent lamps, alternately mounted to give as uniform a light flux as possible. Samples of Oedogonium were obtained and propagated in the tank. The extent of algae growth on the substrates after one week was determined via quantification of chlorophyll content of the cellular growth on the surface. 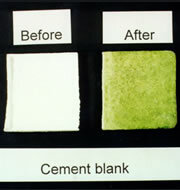 The results showed that an unprotected substrate would become completely covered with algae within a week. Algae growth on an unprotected substrate after one week. 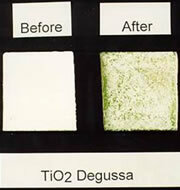 By coating the substrate with a photocatalyst such as Degussa P25 brand TiO2, the rate of algae growth was inhibited by about two-thirds. Algae growth on TiO2 photocatalyst-protected substrate after one week. As this photocatalytic chemistry continued, it became apparent that photocatalyst activity could be improved by adding small amounts of other catalytic substances, or co-catalysts, to the light-absorbing particle surface. The role of the co-catalyst was to facilitate the rate-limiting reaction in the overall photochemical mechanism. Depending on specific conditions, the rate limitation can be either oxidation or reduction. In particular, a loading of platinum (Pt) on order of one weight percent can lead to a rate increase due to faster reduction of dissolved molecular oxygen. The results showed that a Pt-TiO2 formulation could inhibit algae growth by 86%, nearly an order of magnitude better than TiO2 alone. Algae growth on Pt-TiO2 photocatalyst-protected substrate after one week. While Pt-TiO2 was found to be effective, researchers wanted to find cheaper co-catalysts that represent a better value in terms of oxidizing power per dollar. Thus, various co-catalysts were evaluated. Data for a number of co-catalyst combinations are shown in Table I. The values represent algae growth relative to an unprotected substrate. Therefore, a small number means algae prevention, while a large one means no effect. 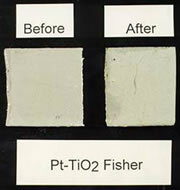 The 0.34 value for plain TiO2 represents a baseline for comparison of the co-catalysts. Some of the transition metal co-catalysts have two entries (ox and red) because different methods were used to deposit them. It is seen that for TiO2, the platinum, carbon, cobalt phosphide, and oxidized nickel co-catalysts improve baseline performance. For WO3, almost all the co-catalysts show an improvement, since the baseline for the unmodified photocatalyst is actually a negative effect (i.e., WO3 by itself tended to facilitate algae growth over that of the cement support). Nevertheless, it is demonstrated that certain formulations, particularly Pt-TiO2 and Carbon-TiO2, can reduce algae growth by nearly 90%.